If you have ‘done’ the whole bingo hall experience and are mildly bored with the same old white label online bingo sites; then you might like to consider something new and decidedly funky to arrive on the bingo scene. Musical Bingo has hit the club scene running. 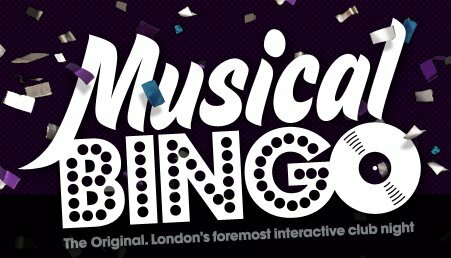 Musical Bingo brings together a heady mix of a pinch of cabaret, a huge dollop of clubbing mixed vigorously with a liberal sprinkling of musical pop quiz. Offering a new bricks and mortar bingo experience like you would have probably not seen before. The creators of the Musical Bingo experience have taken the concept of radio bingo to a whole new level and let’s just say this will provide 21st century thrills and excitement to a very traditional game. There are resident DJ’s; Johnny unknown and Rapture, these are the guys who play the tunes and get the gathered whacky bingo players jumping and jiving as they play bingo to win some fabulous prizes. During their events visitors are treated to great bingo, but with a huge twist. Players will be guided through a number of themed rounds by their ‘oh so sassy’ comperes. Just to shake things up even more, there are further twists and turns thrown in for good measure and maximum entertainment. There is sometimes a multi choice mystery box round, where you could get the chance to gamble your main prize on the killer question. Musical Bingo seems to be the latest trend of our favourite pastime, and their idea to party whilst you play seems to have been a massive hit with the public. Where online bingo lacks the personal touch, Musical Bingo has it all. To give you a bit of history; the game of bingo became popular in the UK when many theatres started to close down back in the 60’s. Land based bingo owners saw an opportunity and took it, taking over many of these disused buildings and making them into bingo clubs. Land based bingo clubs still offer what we call conventional bingo games. These have not really changed that much over the years with traditional 90 ball still dominating play; although one mainstream bingo company is taking the lead in this area; Mecca Bingo who have put fun back into the game with a capital ‘F’. To spice things up and make the game more accessible, online bingo arrived on the scene, which has proved hugely popular with players. Online bingo offers a huge variety of games, which land based clubs just cannot match, well not so far anyway…… that is until more recently. Musical Bingo along with another alternative take on the bingo game, Rebel Bingo is maybe ’the new black’ of the bingo world. Rebel Bingo is the underground of bingo and these guys are about as far removed from the blue rinse brigade as you can get. They are like the punk rock of bingo, where anything goes and we are talking anything. They like to experiment and play dirty, secret hard-core games are the order of the day, so if you like your beats fast and your base down low, then Rebel Bingo is probably the game for you. Musical Bingo is maybe not quite in the same down and dirty league as the Rebels, but they will certainly pimp your bingo ride.